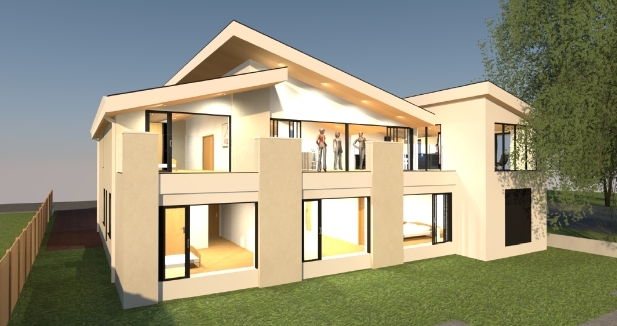 Borough of Poole: Matt Annen is pleased to announce that he has recently secured planning permission for a contemporary, innovative, one-off replacement dwelling overlooking Poole Harbour in Hamworthy. The scheme was designed by Asplan Associates. 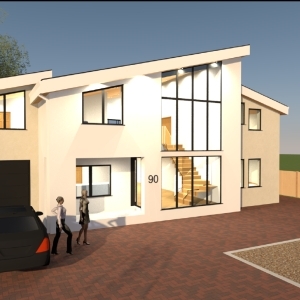 What was slightly unusual about this site was that the works had already commenced on site following the grant of a previous householder planning permission to convert the former chalet bungalow into a detached two-storey house (as opposed to knock down and rebuild a new dwelling). 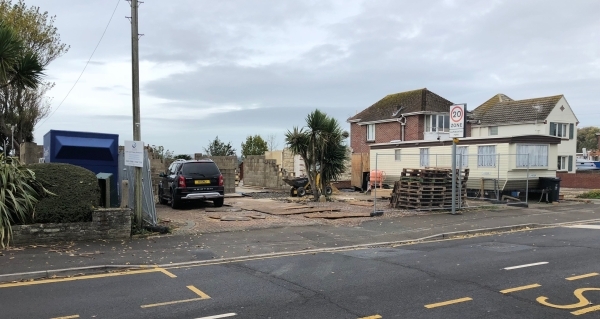 However the Borough of Poole Council alleged that the applicant had demolished more of the existing dwelling than had been consented for and as such they deemed that previous consent could not be implemented. The Council advised that a replacement dwelling application would thus have to be submitted. However, the issue with submitting such an application was that the site fell within Flood Zones 2 and 3 and the Local Flood Risk Standing Advice indicates that the finished floor level for new build houses in this location would need to be no lower than 2.9m AOD, to provide adequate protection against a potential future flood event within the lifetime of the development. However this would mean raising the finished ground floor level up by over 1 metre from the existing land level which presents level access difficulties to the ground floor and normally results in having to have steps up to the front door and down from the patio into the rear garden which is an arrangement that our client was not happy with. Following consultation with the Council and the Environment Agency, whilst the recommended finished floor level would not be achieved, we could demonstrate that we could improve the ground floor level by 40cm above the existing. In this instance the Environment Agency’s advice was that if the finished floor level cannot be raised to the local flood risk standing advice level, they should be raised as high as possible to provide betterment and minimise the future impacts of climate change from sea level rise. In addition we committed to designing the dwelling to ensure that it is protected against potential future flooding, by providing flood resilient measures for the walls and floors and creating safe habitable accommodation at the first floor level (the master bedroom as well as all the main living rooms of the house (kitchen, dining, living rooms etc) were at first floor), which was considered a betterment when compared to the chalet bungalow previously occupying the plot (which had it’s main living rooms on the ground floor). We presented an argument that on the basis that the development would secure betterment over the dwelling previously occupying the site and would not result in the intensification of use of the site, this approach could be accepted. But the final decision fell to the Local Planning Authority to weigh up the planning reasons for not meeting the flood risk requirements against the other planning reasons. The Council acknowledged that compliance with the requirement for a finished floor level at 2.9mAOD would raise the ground floor level of the new dwelling by 1m over the existing level of the pavement, forcing the installation of ramps to facilitate access to the dwelling, which would be at odds with the appearance of the neighbouring dwellings. Furthermore, it would also increase the overall height of the dwelling, which given the prominent, corner location of the site, would be considered harmful to the character and appearance of the street scene. Taking the above considerations into account, the Council concluded that on balance, the benefits of erecting a replacement dwelling that respected the character and appearance of the street scene outweighed the risk of flooding. Planning permission was subsequently approved in line with the 8 week target date. Our client was over the moon with the result; “What can I say? Thank you so much! What a great 60th Birthday Present! I could not have done it without you”. If you are looking to demolish your house and rebuild, or desire to carry out extensive enlargement of your existing house but policy constraints such as Flooding or perhaps Green Belt suggests you can’t then why not contact Pure Town Planning on 01202 585524 or email info@puretownplanning.co.uk for a FREE 30 minute confidential consultation to see if we can find a planning strategy to secure consent for your dream home.